Today I had planned to write a shopping post. Tie in with the made up Black Friday craziness and maybe share some of the deals that around. But, frankly, the amount of emails I’ve had today with the title “Black Friday” is starting to make me feel a bit queasy and my rebellious nature has completely gone off the idea of shopping. But then the Postie arrived at the door this morning with a big box and when I opened it, it contained a Soda Stream, and all the ingredients to make a Sloe Gin Fizz. So I have impulsively decided today is Cocktail Hour instead. I actually already had some sloe gin miniatures from Haymans Gin. I’d planned to make Mulled Sloe Gin at the start of December (so look out for that! ), but this seemed like the perfect opportunity to do both at once. My friend had a Soda Stream when I was a kid, and I thought it was about the most exciting thing ever. So I get a bit nostalgic about them these days. You can fizz up your own soft drinks, but it’s just as perfect for grown up sparkling water to add to your cocktails, like I have here. Oh, and whilst we’re at it, we can’t quite avoid Black Friday, because I’ve just discovered that Soda Streams are 50% off for Black Friday. So, sorry for the Black Friday nonsense, but if you want a Soda Stream for Christmas, I would suggest today is the day! Sloe Gin, sadly, does not appear to be in any Black Friday deals, but it is the perfect liquer to stock up on for Christmas. 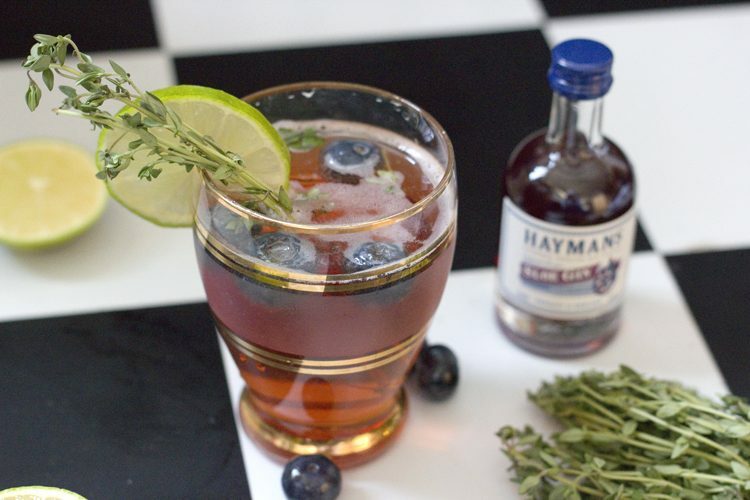 The Haymans Sloe Gin is an intense deep purple (I have a different brand here, and it’s far darker in colour) and the flavours add a perfect festive twist to cocktails. 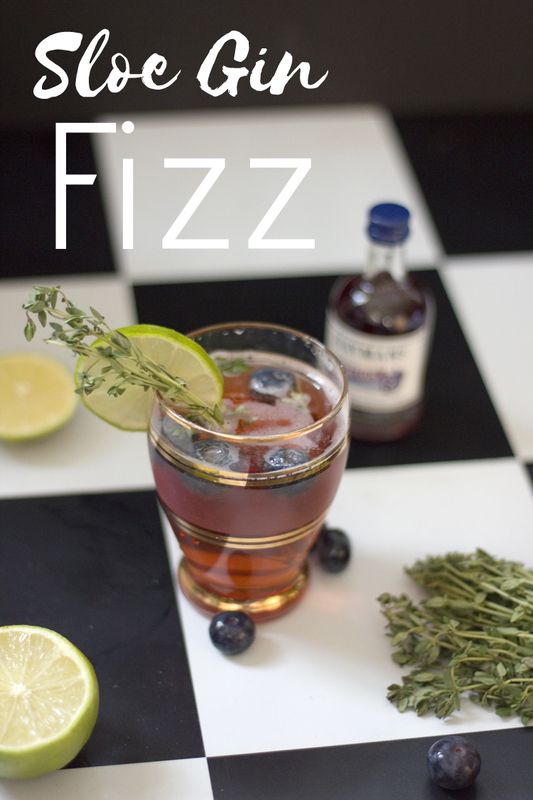 Pour the sloe gin into a glass, top with Prosecco and add a splash of sparkling water. 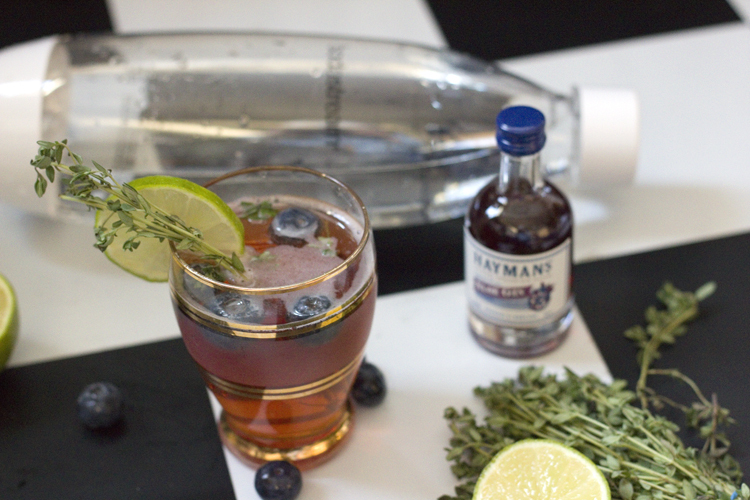 Garnish with a sprig of thyme and a slice of lime. Adding frozen blueberries will keep your drink cold with out diluting.